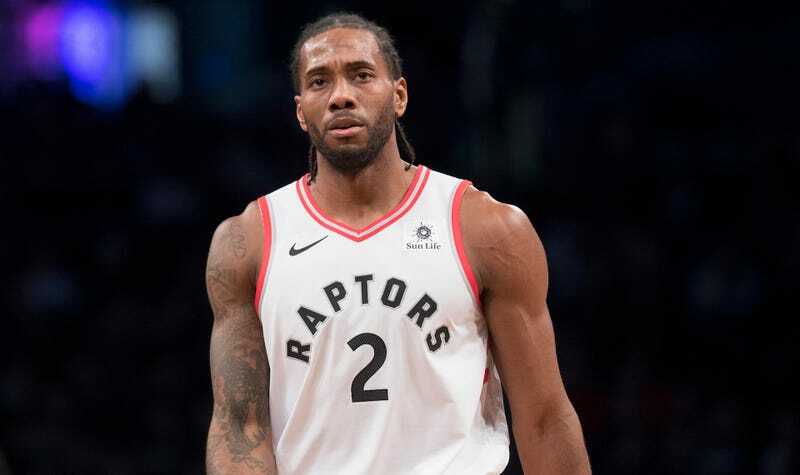 Kawhi Leonard and the Toronto Raptors will travel to Oakland tonight for a showdown with the suddenly healthy Golden State Warriors. As ESPN’s Brian Windhorst laid out in a report Tuesday night, nobody is more excited to attend the game than a bunch of front-office guys for the Los Angeles Clippers. Windhorst’s story details the Clippers’ dedication to recruiting both Leonard and Kevin Durant this offseason. Obviously, any team in the NBA would be happy with either player and ecstatic with both, but none has been as devoted to the chase or as obvious in its infatuation as the Clippers. The team has actually been solid this year after moving on from Blake Griffin and Chris Paul, with Tobias Harris flourishing after landing with his fourth team in seven seasons and rookie Shai Gilgeous-Alexander impressing the entire league. Still, the Clips will have two maximum-salary slots open this offseason, and they transparently are doing everything they can to fill them with Leonard and Durant. Windhorst wrote that the team hired Jerry West for recruiting reasons, and he finally figured out what the hell Lee Jenkins is supposed to be doing there: the former Sports Illustrated feature writer’s previously unspecified role with the team will be to craft a recruiting pitch for the two superstars. But even by these modern standards, the Clippers’ pursuit is still a little revolutionary. Raptors officials have noticed a Clippers employee at roughly 75 percent of the team’s games thus far this season. Clippers officials say they’ve been at less than 50 percent of Leonard’s games. There have been games they attended where Leonard rested. That has included president of basketball operations Lawrence Frank, which is rare. Presidents and general managers are almost never seen attending a game that doesn’t involve their teams. Uh huh. The Clippers are definitely timing their texts to Leonard so that they reply only after four hours have passed.